It may have been the hottest ticket in town, but the third Sydney Derby couldn’t deliver what the respective teams and their supporters came for: a win and three points. With Western Sydney Wanderers wanting to get their hands on the Premiers plate, and Sydney FC fighting to seal a spot in the finals, the one-all draw keeps aspirations alive for both teams. In many ways, it was the right result, maintaining the status quo right up until the final chapter of this most tight and thrilling of regular seasons. If the Central Coast Mariners take all three points in Adelaide today, then the Wanderers premiership fate will be decided on Good Friday, away to a desperate Newcastle Jets. With injuries and suspensions hitting the Wanderers at the wrong end of season, and the re-signed Shinji Ono joining the list last night with what looked like a strained groin, that won’t be the easiest of tasks. Certainly though they will have a travelling band of passionate fans make another trip up the F3 to lend their voice and support. In all likelihood, the travelling Red and Black Bloc will be more intimidating than the one assembled at Wanderland last night, where they were often drowned-out by the travelling Cove. With tickets to the blockbuster selling out in a matter of minutes, and the interest in the RBB and Wanderers growing more rapidly by the day, there’s no doubt there was an element of the theatre-goer among the Wanderland masses last night. It meant that a significant number of regulars at Wanderland and Allianz missed out in the mad rush and had to make do with a seat in front of the box. It’s an inevitability of the success the Wanderers been in their inaugural season, and the interest generated by Alessandro Del Piero. 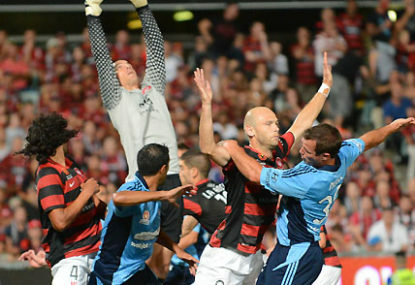 Everyone, it seems, wants a piece of the Wanderers and Del Piero. One gent I bumped into pre-game admitted he’d never been to an A-League game before and, after scoring a ticket in the online rush, was there to see what all the fuss was about. Even from a couple of regular members of the RBB I heard a few complaints post-match about the number of more casual fans, perhaps not versed in the ways of active support, that had scored a spot in the northern terrace. The growth of the RBB has made it difficult for those organising it to control it, and the recent tensions with the FFA, police and Parramatta Stadium have only made things more difficult to manage. In the meantime though, both Tony Popovic and Frank Farina will be searching for the right solutions ahead of next week’s games against the Jets and Brisbane Roar respectively. There have certainly been a few better signs from Farina’s men in the past fortnight, with finally starting to gel and take some shape. Up until his send off for going into a tackle with his studs showing, there Brett Emerton was settling in well into a role in the centre of midfield. Certainly his physical presence and drive have helped. Now Farina has to start again. It’s been that kind of season for Sydney. But their more compact defensive structure and higher defensive line appears to at least be giving them a chance. It looks a foundation that at least gives them a chance of taking all three points in Brisbane on Thursday and causing the odd upset if they can make the finals. Even when they went down to 10 men and with Del Piero dropping deeper alongside Peter Triantis, to make it a 4-4-1, Sydney were able to remain structurally disciplined. The pity is it was their on-field discipline that let them down. Against a Wanderers outfit that was clearly missing a number of key players in Youssouf Hersi, Jerome Polenz, Michael Beauchamp and Aaron Mooy, Sydney controlled good parts of the match, particularly early, even if they still rely on Del Piero for much of their goal-threat. The Wanderers, meanwhile, may even seal the Premiership tonight if Adelaide can do them a favour. If they don’t, they will go to Newcastle on the back of an 11 game undefeated run that should at least give them enough belief to get the point (or win) they need. But there’s no doubt, throughout March, as injuries and suspensions have hit, that their form has dipped from their lofty standards set in January and February. Certainly much of their success has centred around having Ono and Hersi fit and able to influence, and that will be the focus in the next couple of weeks. In the tightest of seasons, it was ultimately no surprise to come away from the third Sydney Derby with everything still at stake.